The community at Photofeeler, our profile photo testing platform, has put in a lot of research requests over time. Our users have always been interested in what our data says about gender bias related to LinkedIn photos. In fact, this has been our most requested analysis from day one. So today, I’m excited to finally share these findings with you! 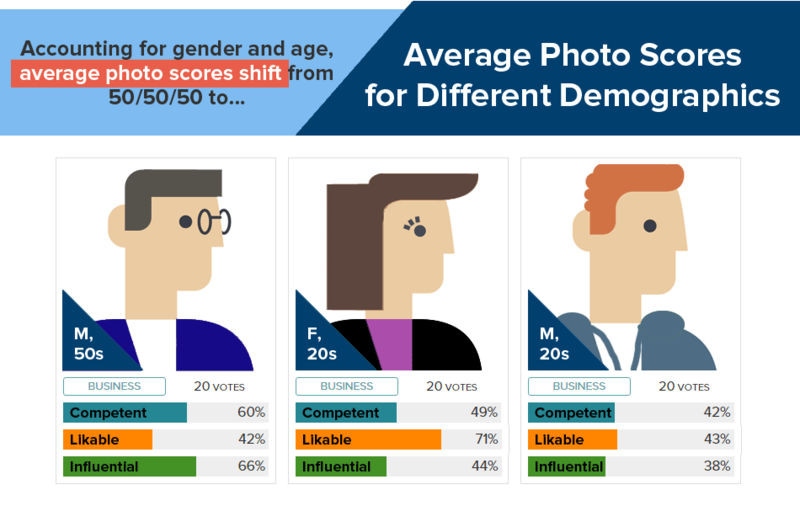 This independent research study was based on over a million ratings of perceived Competence, Likability, and Influence for 100,000 “Business” profile photos in our Photofeeler database. We’d love it if you would share this infographic and spread the word about this research so we can do more of it! Just be sure to include a link back to Photofeeler.com for attribution. And, of course, if you’d like feedback on your own photos (business, social, or dating), be sure to visit our main site. To break it all down, here’s our discoveries explained in greater depth. Detecting gender bias in a sample is often more complicated than people think. That is, looking at gender only, you may see some differences between how men and women’s photos perform, but they are usually pretty small. When you put gender against other factors you see much more distinct patterns. 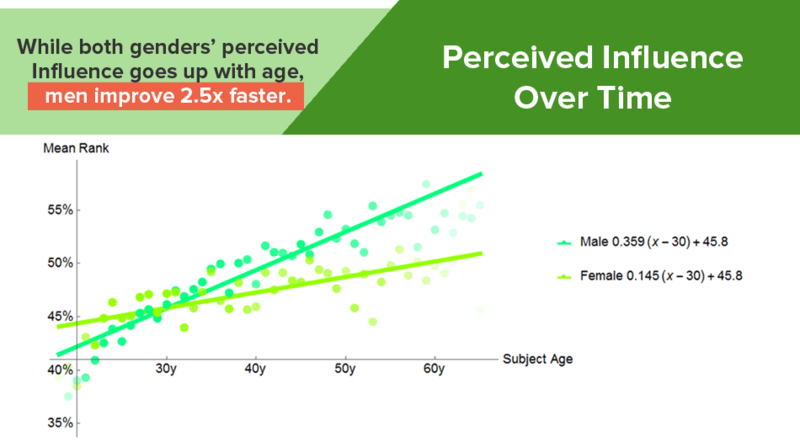 In this study, we used age to test for gender bias. This allowed us to see solid patterns such as those shown below. According to our study, men over 35 are perceived as more Competent and Influential than any other group in significant measure. In essence, the state of being male and middle-aged makes you appear smart and in charge. What you see in the chart above is that young women in their 20s score a bit higher than young men in their 20s. Later on, while both genders improve with age, men improve 6x faster. The crossover occurs around age 34. 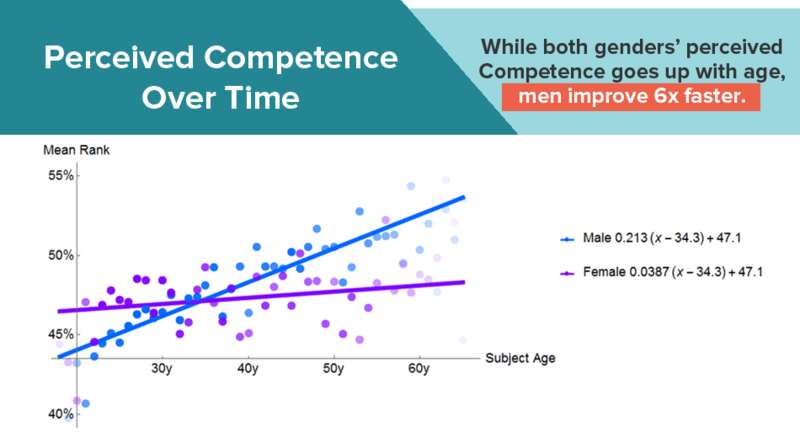 As shown in this chart, perceived Influence improves with age for both genders (even faster than it did for perceived Competence), but men still advance at 2.5x the rate of women. So if you want to be perceived as Competent and Influential, it sure helps to be a man over 35. Younger men do not fare as well, however. In fact, women in their 20s outperform men their own age in all three categories of perceived Competence, Likability, and Influence. There are many ways one could interpret this. It’s been our observation that men in their 20s put significantly less effort into their LinkedIn photo than do women their age. A look at the sample photos revealed many blurry, candid shots of young men in hoodies, whereas women of the same age were more likely to dress up and take a professional headshot photo. Finally, there is a distinct advantage that women have on men across the board, and that advantage is perceived Likability. Female Likability is a complex topic, as many other researchers have found. The reason is that, as we can confirm in our data, our perception of women’s Competence and Likability is more strongly correlated than it is for men. In other words, we have an easier time separating how Competent we think a man is from how much we like him. Women’s perceived Competence is more closely tied to their Likability. If you like a woman, you’re more likely to think she is smart. If you don’t like her, you’re more likely to question her intelligence. 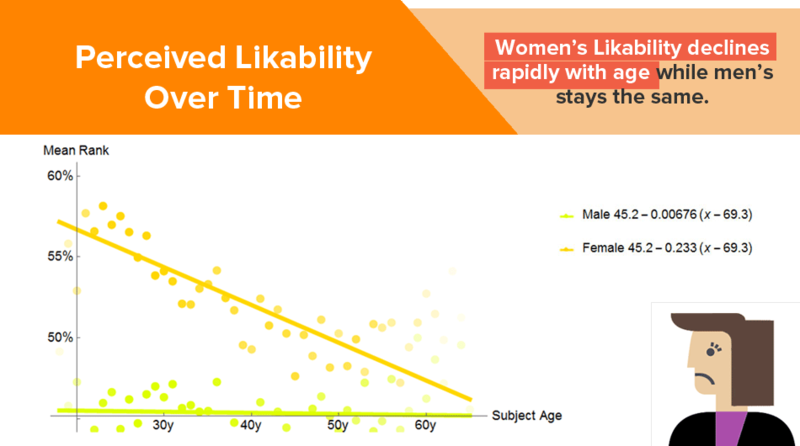 The fact that Likability is more valuable to a woman than a man may mean that women put more effort into achieving Likability, and this may account for some (though probably not all) of the difference between men and women in scores. Still, there is a catch. What you see in the above chart is that women’s Likability declines rapidly with age, whereas men’s stays consistent over time. 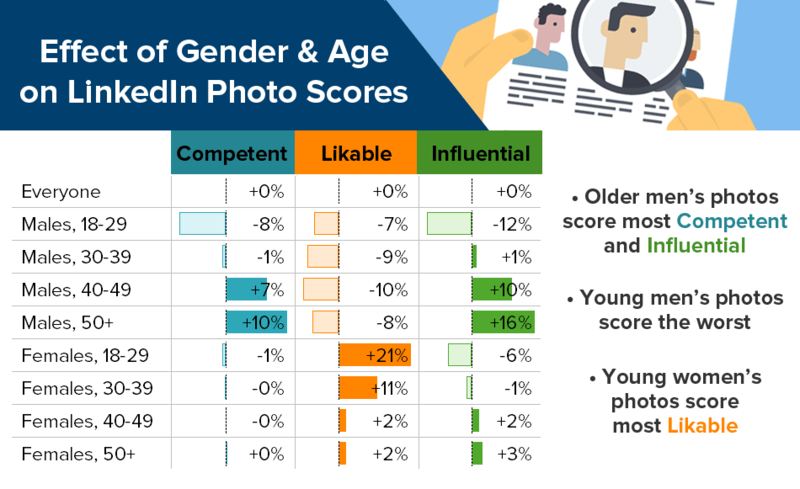 This concludes our gender bias findings related to LinkedIn photos. It’s our hope that this information will make us all a little smarter — in our own dealings as well as how we see and relate to others. Post image by Marius Boatca.